Fancy Color diamonds are highly sought after because of their extreme rarity, capturing beauty, and unique color combinations. Colored diamonds range from extremely rare and expensive stones to more obtainable and affordable ones. But where do these natural colors come from? Here is a closer look at the origin of these beautiful and fascinating diamond color. The origin of the pink diamond color is still debated among top gemologists. Many scientists claim that this is a result of the incredible pressure that the diamonds endured as they rose through the earth, closer to the surface. The ‘Plastic Deformation” caused is believed to be the cause of the amazing pink and red colors in the stones and often leaves both internal and external graining in the diamonds. The most common Pink diamonds found contain purple, brown, and orange overtone colors. Though a pure pink diamond can be found, it is rarer and therefore more expensive. Yellow diamonds, next to Brown, are some of the most commonly found colored diamonds and by far the most popular. Furthermore, as a result of their abundance in nature they happen to be quite affordable as well. Of course there is a huge range in color intensity, and the higher the intensity the more expensive the stone. 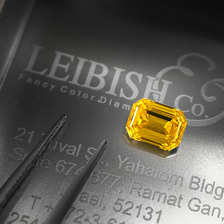 The cause of the yellow diamonds sunny color is the concentration of nitrogen within the stone. Yellow diamonds often include secondary hues such as orange, brown, and green. Orange diamonds belong to the yellow and brown diamond families, which receive their colors from traces of nitrogen found within the compound element of the diamonds structure. Pure orange diamonds are hard to come by, and in fact are considered quite the collector’s item as well. Pure orange diamonds are found, but most commonly they contain Brown, Yellow, or even Pinkish secondary hues. Green diamonds owe their unique color to natural gamma radiation. The result of the radiation was the displacement of atoms in the diamond’s crystal structure. Like many other of the colored diamonds, a pure green diamond is hard to find. More commonly, diamonds with a yellowish green, green-yellow, or grayish yellowish green color are found. Interestingly enough, since it is quite difficult to identify whether a Green diamond is enhanced or not, many polishers leave a section on the Girdle of the stone rough, called a Natural. This way the GIA, or other diamond institutions have what to test when classifying the stone. Blue diamonds are caused by the presence of boron. Though there is a high demand for blue diamonds, there is an extremely small supply. There are blue-green diamonds that owe their color to the radiation that they were exposed to during their formation. Other blue diamonds such as grayish blue diamonds receive their color from the presence of hydrogen, though this is incredibly rare. Brown diamonds, commonly known as ‘champagne’ colored stones, are quite similar to Yellow diamonds. In fact, Brown and Yellow diamonds are the only colors whose colors start from within the white diamond color scale. Brown diamonds are rather common and on the inexpensive side. Their color is caused by traces of Nitrogen within the diamond element. Depending of course on the intensity of the brown and the modifying colors found in the stone, the diamond could be quite affordable or fairly pricey. Though colored diamonds all share the title of ‘diamond’ they all have different contributors to their color and how they came to be. This is not only interesting but it also has an effect on the value and appearance of the diamond. Learning more about a colored diamond’s color’s origin can help one become more informed before deciding to buy a certain color diamond.